I have to start off by saying that I am a bit biased here. Empowered is one of my favorite series, and Adam Warren is a genius! This special is one of the best things I’ve read from the series. I laughed with Ninjette, got angry with Ninjette, wanted to dance with Ninjette, and even cried with Ninjette at the end. No, really, it’s quite sad, but very endearing. Ninjette is BFFs with the also adorable, and star of the series, Empowered. I’d say that Ninjette is the Ying to Empowered’s Yang, or what have you. She’s outgoing, charming, daring, deep (no, seriously), and quite brave! Her drinking abilities also happen to equate to her ninja skills (and maybe even her dancing skills). Our “hearty-partying” heroine tells quite the tales in this one-shot. Ninjette goes through nine beers, and with each beer comes a story and the emotions that go along with it. She also brings her bestie Empowered along for the ride…at least for as long as Emp can keep up. I have to say, Ninjette and Maidman have some mad skills on the dance floor! I also want to go punch Ninjette’s horrendous a**hole father in the face! That’s all I can really say, because I don’t want to give away too much. I will add that the end will definitely tug on your heartstrings. Don’t worry though, all the Empowered humor is still there. I love that I really got the chance to know Ninjette. She is such a great character, and would definitely be my favorite if I didn’t relate to Emp so much. I KNOW Empowered fans will love this special. Even for those who haven’t read any of the series yet, this is still worth a read. It will give you a taste of what Empowered is all about, through the eyes of one of the best characters. 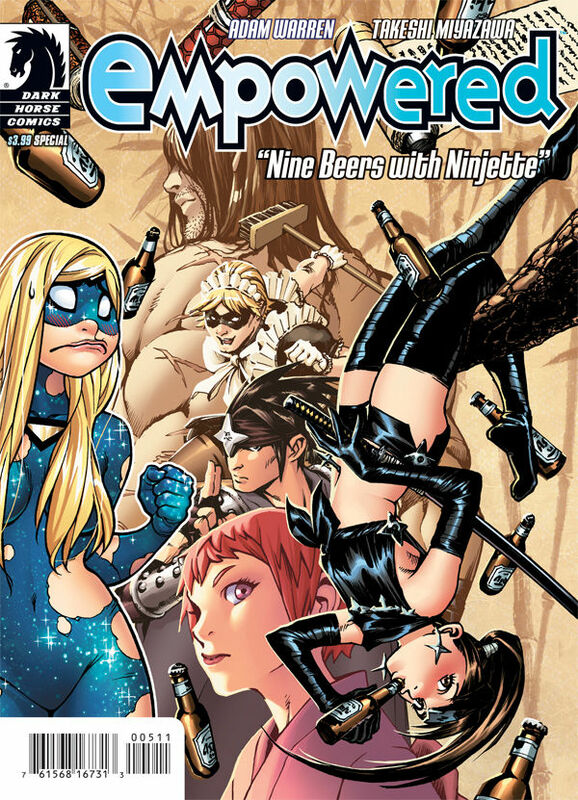 Empowered Special: Nine Beers with Ninjette will be in your local comic shop, or equivalent store, on 9/25. You can also purchase the digital copy, or order a print edition, straight from Dark Horse.